At the international meeting on nuclear safety, Silvio Berlusconi - our most prestigious international pride… - yesterday waited about 40 minutes the car that would have to bring him at the Willard Hotel, to digest the sumptuous dinner hosted by Obama to fellow Heads of State . As usual, he must be recognized, many will say. It’s impossible for him to not do it: if he cannot get the limelight for reasons that go beyond official duties, he’s not happy, many others will think. However, this time the blame is not on him. That is, it’s not directly, since the delay is all responsibility of the driver. I am the person that was supposed to take the Italian premier. The fact is that when I knew it was him… I refused. The reason is simple: because I'm an honest citizen. Because I pay taxes, even if the opposite is trendy. Because I respect women, even when I don’t need them. Because I also have skeletons in the closet, but I’m at any time ready to respond of them. Because since I was born I never stopped believing that my country can be better than how I found it. Because since I was born I never thought that this will happen easily. Because when I look in the mirror I see a face that doesn’t need smiling to convince others of its sincerity. Because my word is worthy and I thank those who reminds me when I forget. Because I never made oaths on my children, even when I was perfectly sure that I will keep them, let alone reverse. Because I don’t want to lose my job, but I’m tired of being ashamed of my country. Because I'm tired of staying to watch the lives of the rich in a rearview mirror. Because even an ordinary person like me can make a choice that may stop their run. Because if the driver stops they will have to guide alone. Because if I will remain at that steering wheel, I will be accountable too. Because being part of the injustice machine is ever a crime, whether you sit in front and rear. Because from now on, if I will help someone in his journey, I’ll want to be sure that his trip won’t cause suffering to anyone. Because they can fire me for this, but nobody can take away the respect to me. 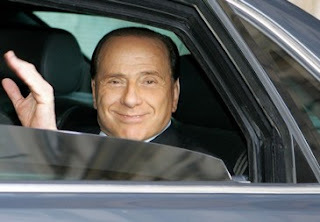 The News: Berlusconi waits his car for 40 minutes.